Normally, in the majority of cases, individuals with misaligned teeth or other bite problems can be successfully treated with braces or a different type of orthodontic appliances. Jaw development in a growing child can even be guided to improve tooth alignment when appropriate treatment is received before puberty. Occasionally, orthodontics and braces alone aren’t enough to correct problems with the teeth or jaws. In these situations, Dr. Travers may choose a surgical approach as the best option. Correcting these issues in an adult may involve surgically modifying one or both jaws. The goal of corrective jaw surgery is to improve basic oral functions such as chewing, swallowing, speaking and breathing, and to restore facial symmetry. Jaw surgery, performed in combination with orthodontic braces, is a collaborative process that often includes orthodontists, general dentists, and oral and maxillofacial surgeons. The first step is a thorough evaluation by the orthodontist and the surgeon, which typically includes x-rays and other diagnostic imaging (such as photographs and CT scans), and actual or virtual models of the dentition (teeth and jaws). Using this information, a complete treatment plan will be designed for each individual's situation. Several months of orthodontic treatment is often necessary before surgery, to align the upper and lower teeth in preparation for the procedure. The surgery itself is generally performed under general anesthesia in a hospital, an ambulatory surgical center, or an in-office operating suite. Following a recovery period, a second phase of orthodontic treatment with braces may be needed to make minor adjustments and ensure the stability of the re-aligned bite. The total treatment period, including pre- and post- operative orthodontics and surgery, may be 1–3 years. Orthognathic surgery is generally only considered when more conservative treatments (such as orthodontics) are judged insufficient. Therefore, it isn't typically appropriate for a minor malocclusion, abad bite. However, it may be recommended for moderate to severe misalignment of the jaws. As with any type of surgery, it carries certain risks, including infection, numbness and adverse reactions to medications or anesthetics. Before any procedure is undertaken, the potential benefits and risks will be explained; you should feel free to ask for more complete information about any aspect of treatment you don't fully understand. Due to the fact that this type of surgery makes permanent changes to the jaws, it isn't suitable for young people whose bones are still growing. However, for adults and some teens, corrective jaw surgery can bring about many positive changes in oral function and appearance that couldn't otherwise be achieved. 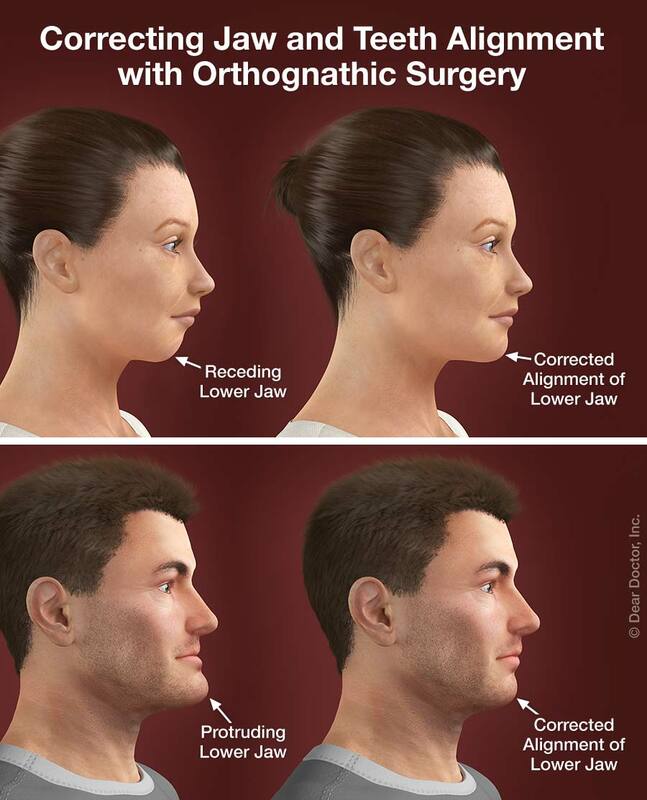 If you believe your jaw is misaligned and may need corrective jaw surgery, call Travers Orthodontics in Irving and Coppel, Texas. Our orthodontist and orthodontic team will be happy to examine your jaw and bite to determine if you’d be a good candidate for corrective jaw surgery. As always, if you have any questions or concerns, please ask our staff. We will be more than happy to discuss the procedure in depth and confirm you understand all of the information. Schedule an appointment with our orthodontist or call our Irving, TX office directly. We look forwarding to transforming your jaw and bite for the better!